…cos I feel like blogging not working. 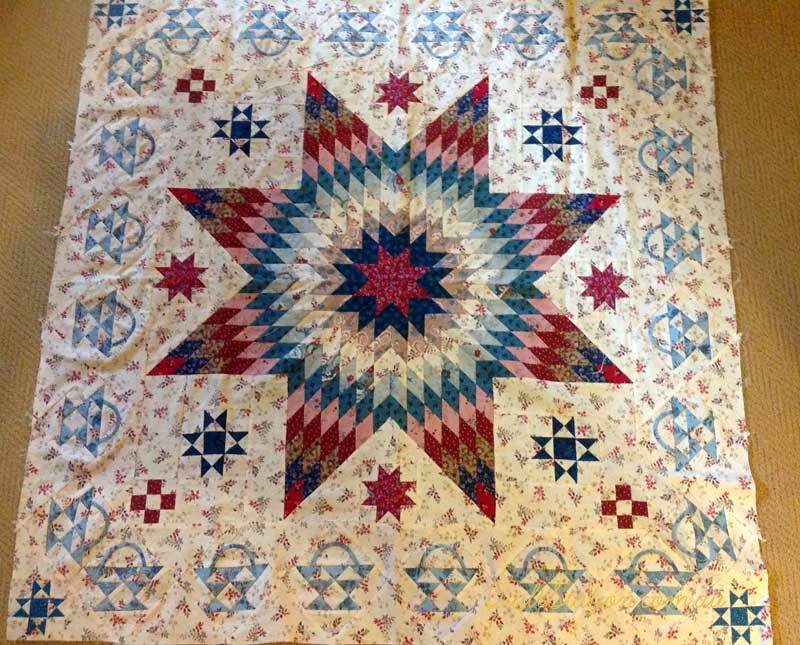 but before I show you how it’s evolving I want you to see how the 1800s Sunburst is looking now that all the blocks are together. 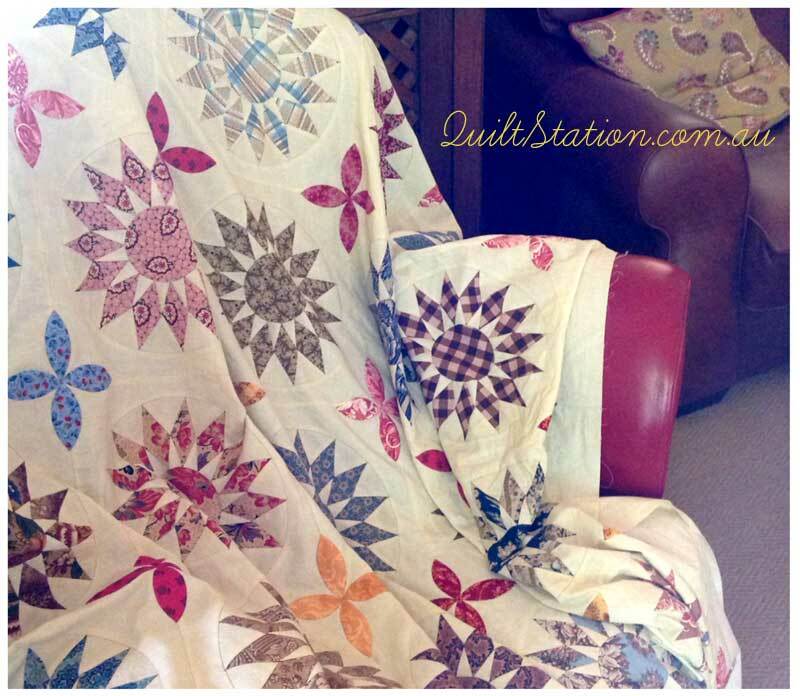 We all know what a nice feeling it is when the last bit of stitching is done on a quilt top. 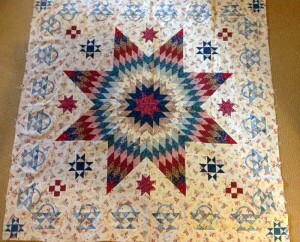 And this one was no exception…that was a lot of hand pieced circular blocks! The applique petals were very quick to do though and now it she is all ready for the quilting machine. 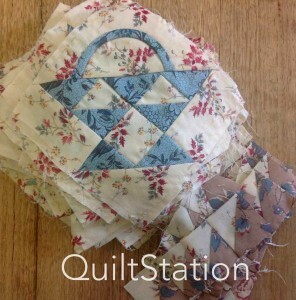 I’m not in a great hurry to quilt her though…I’m still mulling quilting ideas over in my head. So back to the Connecticut quilt and when I left you last I was pondering whether the baskets would stay or go…Thank you for all your kind and encouraging comments, I really appreciated the input. 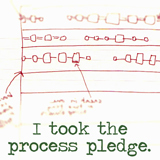 …and in true Libran style I changed my mind and they didn’t go back on. You see I’ve always liked these little Peony blocks. I’m just finishing the last half dozen or so blocks at the moment and then that will be a border complete. This is how it’s all looking so far. There’s still a wee way to go with it…more borders of course. But sooo nice to be moving forward with this after a long hiatus. 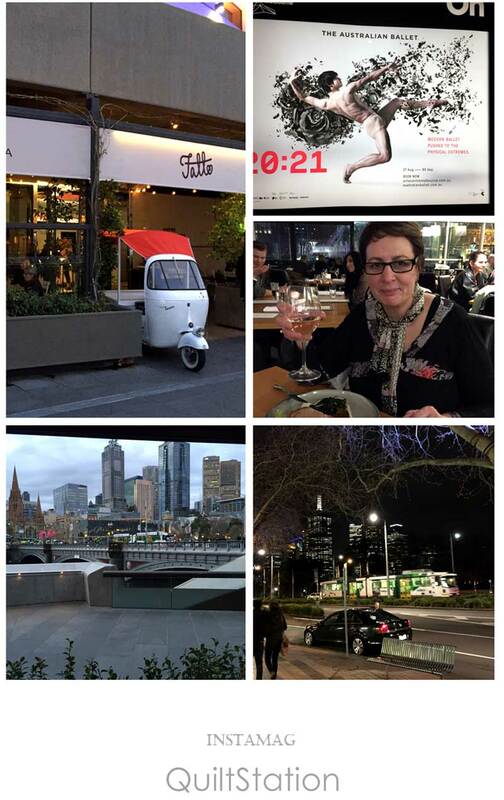 Spring is in the air here and it was lovely to spend an evening in the city with my darling daughter recently…drinks, ballet, dinner. 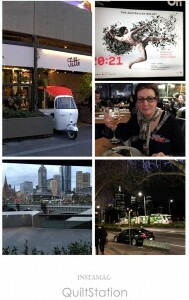 I had fun making this photo collage of our evening. Wow I love the peony blocks!!! 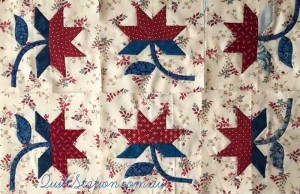 The Sunburst is a beautiful quilt I look forward to seeing how you quilt it. I was one who voted for the Basket blocks, but I must say I like the Peony blocks just as well! 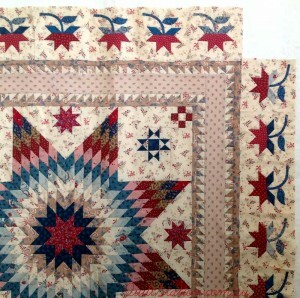 It is beautiful and will be more so when quilted. The baskets were nice, but a bit insipid. The peonies are a much better fit with the star and it’s looking really exciting now. I love peonies and I especially like the stems on yours. I can hardly wait to see where you go with this top now! 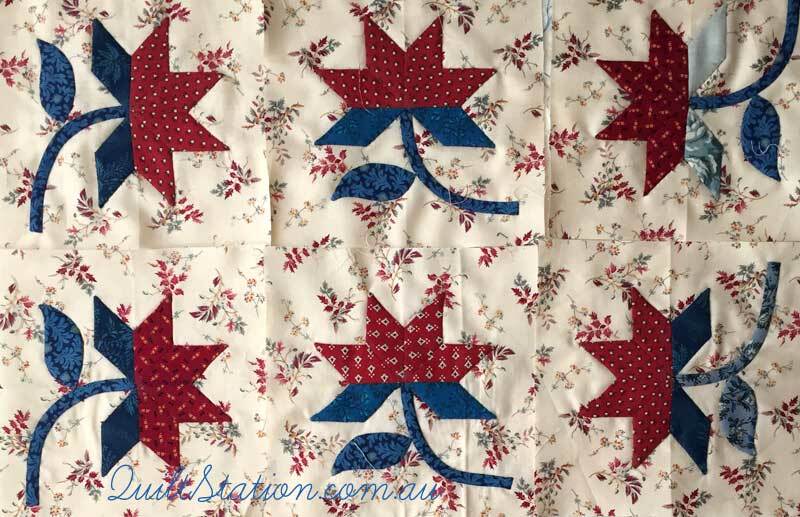 Wow the peony blocks set off the quilt perfectly – good decision, though I do love those basket blocks too! The red in the border ties it together beautifully. Your work is always so inspirational – and I adore that sunburst quilt – a marvelous study in fabrics and colour! 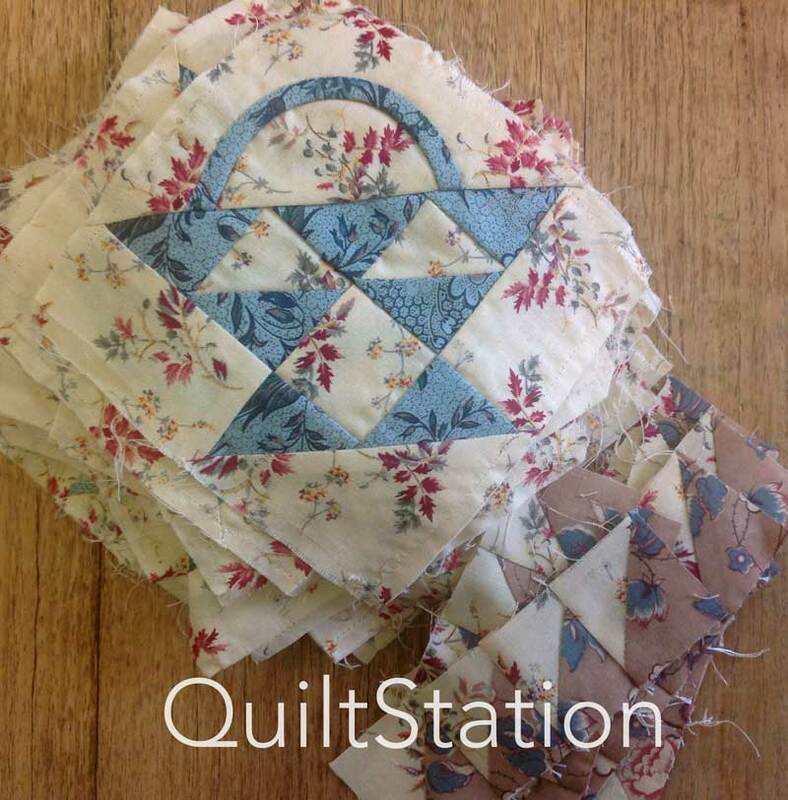 I do like Take 2; the peony blocks look perfect for the quilt. Just stunning Margaret, I do love the peonies.